Billed to perform alongside Olujazz were master acts like Wole Oni, Tim Godfrey, Lawrence and the Covenant, Onos Ariki, IBK. 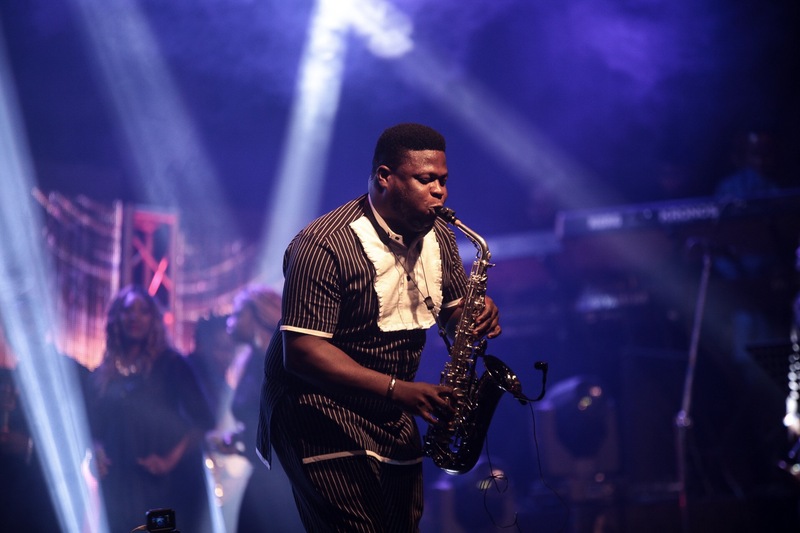 It was a dream debut concert for the American-trained Nigerian saxophonist, OluJazz, at the Shell Hall, Muson Centre, Lagos, recently. Living up to his billing as Olujazz D’Talkative, the saxophonist talked thirteen to a dozen with the sax, leaving the audience longing for more jazzy tunes. At intervals, the enraptured audience stood up to clap, danced, and let tears of joy stream down their faces, yet there were some among the audience who, unconsciously, went into meditation as gospel songs wafted out from the sax. It was a memorable night. By 7 p.m., the hall was filled to the brim for the Olujazz Live in Concert. Billed to perform alongside Olujazz were master acts like Wole Oni, Tim Godfrey, Lawrence and the Covenant, Onos Ariki, IBK. Billed to perform also were the Nigerian, US-based Jazz rhetoric Agboola Shadare; Lara George, Evelyn J, Tim Godfrey; Isaac Gerald, the Luther Vandross of Nigeria; and Ranti, an opera singer. Chants of “Olu” rent the air as he took to the stage. There was a traditional Yoruba atmosphere as the talking drums cleaved the air. Dressed in white blazers, the artiste looked dapper, and the first song jazzed up the audience, who sang along. The second performance by Olujazz was more passionate. It brought memories of Sunday Service as a praise songs floated in the air to a danceable rhythm and sax. “You Are a Great God”, “Jehovah Has the Final Say”, “Ebube Dike”, and “You are the Most High God” were the songs performed with a jazzy touch. He also performed another Igbo worship song “Iyiri Ihe Asi na Ibu”. Afterwards, he switched to western worship song, “We Give You All the Glory”. The artist struck a bond with the crowd as he dished out one hit tune after another. Lara revved up the evening with more melodious tunes, including “Alagbara Almighty”. When OluJazz began the second round of songs, he appeared in casual black ensemble. Lifting the sax, he got everybody nostalgic and dancing to the highlife classic “Jeromi” by Sir Victor Uwaifo. Then, Isaac Gerald upped the ante in a duet with Olujazz. You would think it was an American jazzy combo with the medley of western beats. It was a sight to behold as he compelled Olujazz to the stand to mimic his voice. The show also featured opera songs by Ranti, among other conventional acts. Speaking on his fascination with the music genre, Olujazz said, “I want to play music, especially Jazz, for the rest of my life, because without music I’m nobody. Music is in me. Anywhere I go, I’m known as a musician. I’m one of the few people in the world that can actually speak four phonics; not everybody can say it. He has performed at the Santiago Jazz Festival, Chile and California, which happens every year. “I’ve also travelled far and wide. I’ve travelled on musical tour to countries like France, Germany, Ethiopia, Asia, America, Canada, Brazil, and Puerto Rico for Jazz music performances,” he said.